Everyone knows that you can’t judge a cartoon or comic book adaptation by its trailer; you can, however, feel free to judge it by its theme song. Every great cartoon of the ’80s and ’90s lived and died by its theme song, and no show embodied that idea better than Teenage Mutant Ninja Turtles. The heroes on a half shell loved theme songs so much that every few seasons they re-inevented them, replacing synths with hip hop beats and adjusting the shrieking vocals to a different decibel each time. Even the films got in on the action, churning out memorable, if not impeccably crafted, earworms that would resonate throughout your skull for hours afterward. With the latest incarnation of the turtles set to hit theaters on August 15 (with a brand new theme song of its own, natch), we decided to take a look back at some of the sonic works of genius that the Teenage Mutant Ninja Turtle franchise has gifted us with over the years. And yes, you are about to be shell-shocked. The Teenage Mutant Ninja Turtles are no ordinary heroes. 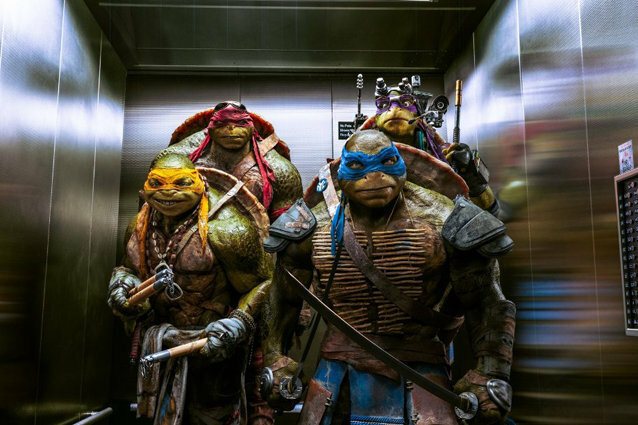 They’re goofy, ridiculous, and over-the-top… they’re literally mutated turtle warriors who live in the sewers and eat pizza. They deserve better than wordless, generic drama that would work just as well on any random action movie out there. Where’s the personality? Where’s the fun? The theme song for the 2003 animated series starts out strong, with the dramatic introduction, the wailing guitars and vocals that sound like a failed audition for a hair band. But the attempt to be exciting and retro starts to grate very quickly, and it feels like the composers were trying too hard to re-capture the ’80s TV show, instead of embracing the essence of their turtles. Also, the phrase “heroes on a half shell” isn’t mentioned once, and that’s just unacceptable. There is perhaps no phrase in the world that better encapsulates the ‘90s than “Vanilla Ice’s song for the live-action Teenage Mutant Ninja Turtles movie, ‘Go Ninja, Go.’” But the real beauty of this song isn’t in watching Ice and some turtles break it down in some baggy, high-waisted pants while his hair flops about with a mind of its own. No, it’s in Ice’s poetic lyrics where the song really shines, thanks to lines like “Lyrics. Fill in the gap,” and “Ninja, ninja rap.” And just in case you need time to recover from those pearls of song-writing, it ends on an extended dance break. That’s the voice of a generation right there. When you think Teenage Mutant Ninja Turtles, surely the first names that pop into your head are (Oscar winner) Juicy J, Wiz Khalifa, and Ty Dolla $ign, right? If you’ve never heard some of the most popular rappers of our day rapping about pizza, turtle power, and about wanting a cut of the cheddar like Shredder, you haven’t truly lived. Presumably, it was an attempt to bridge the gap between a child-friendly property and a more grown-up movie, but it really just succeeds in being a glorious cacophony of ridiculousness. If you’ve ever wondered what the sonic equivalent of a Michael Bay movie would be, well, this is it. The theme song for the first Teenage Mutant Ninja Turtles film caters to a very niche demographic: fans of old school hip hop and live-action interpretations of beloved cartoons, who has difficulty remembering key plot details. “Turtle Power” is basically a scene by scene summary of the film’s events set to a slick beat – and by slick, we mean “has a lot of DJ scratch effects in it” – but it’s just so ridiculous that it’s hard to be upset at the unimaginative lyrics. There are three dance breaks! We can’t get mad at that. From a songwriting stand point, this theme song barely scrapes past “Turtle Power,” in terms of creativity and complexity. But as far as an introductory song for a children’s show, it’s pretty well done. It introduces all of the characters, the premise, throws in a few clever puns about being “shell-shocked” by a “lean, mean, green ninja team,” and the beat is surprisingly catchy. Sometimes you don’t need to reinvent the wheel. Sometimes you just need something that will make kids sit still for thirty minutes at a time, and a slightly shouty chorus that will no doubt echo through the house for hours afterwards. It’s the classic theme song formula: throw together a repetitive chorus, some clever rhymes that establishes the show’s premise and set it all to some sweet, sweet ’80s synths. Add the right amount of sugar and you can practically picture children jumping around their houses, screaming “Teenage Mutant Ninja Turtles” over and over again. It’s simple, it’s memorable and it will be stuck in your head for the next nine hours, and recur every time someone brings up the heroes on a half shell. You’re welcome.